This page is devoted to Hale hammers; other various Hale piano tools are shown throughout this ‘site. 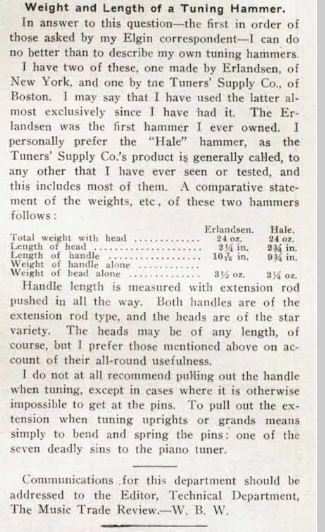 The Hale tuning hammer was one of the best on the market, from its invention in 1885, but there was competition from Erlandsen, whose tool production had already been established since 1863, and from Hammacher Schlemmer, whose hammers were mostly made by Erlandsen. 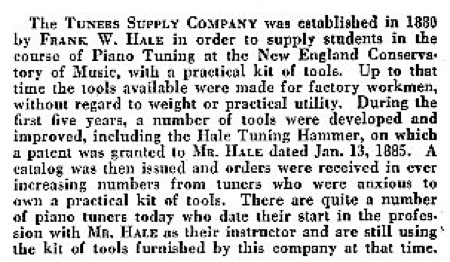 After WWI, Hale hammers became more of the leading choice for piano technicians and tuners. Market share increased after 1929, as the industry shrunk, Julius Erlandsen downsized his business during the 1930s, and Hammacher Schlemmer moved to midtown Manhattan in the 1920s, and became more interested in marketing the high-end novelty items that they are known for today. Hale hammers went through a number of permutations during their production, which lasted well over a century. This review of the Hale hammers does not purport to be a type study along the lines of the many Stanley tool studies (where there are all too often many examples of exceptions to the various categories), but more of a general review of the the history and development of the Hale tuning hammer. In compiling information for this, I have used U.S. patents, advertisements, technical circulars, catalogue excerpts, and the actual tools. As far as I know, there has not been any previous outline or retrospective done on this very specialized subject, so I’ve put it together from scratch, relying on what information that I have been able to cull. This also applies to my page on the history and development of the Erlandsen tuning hammer. 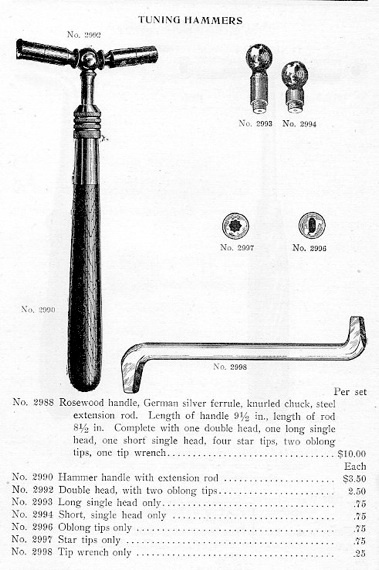 Earlier Hale hammers (1885-1913) with German silver hardware–while some of the most beautiful tools ever made–had an extension feature that was not as robust as the later hammers. 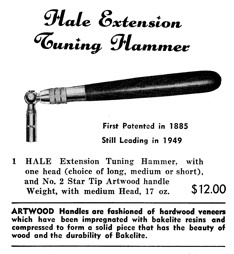 Hale hammers with the pre-1908 tuning tips were more suited for tuning older American pianos in original condition up to the early 1960s, and for many European pianos. Good used Hale hammers made after 1914, however, are still in demand from some tuner technicians who appreciate traditional methods and vintage tools that are still usable in a practical sense. Post-1908 tuning tips are interchangeable with more current APSCO, Schaff, and Watanabe tips, and the 1/8″ tapered pipe thread (introduced c. 1925) for the head and shaft is still used on Schaff and other modern hammers. A full range of hammer head lengths and shaft boring angles (from 5 to 25 degrees) were available, making the Hale hammer quite versatile for a wide range of tuner preferences, including an extra long head and tip for stringing, which allowed for extra clearance over the cabinet while pulling up the string tension. The steel compression nut (introduced c. 1916) locked down the round shaft (c. 1942–1990s) securely, but the octagonal shaft (c. 1909-1942) was even more solid with no rotational movement under stress. Later Hale hammers with grey Polypenco nylon handles (c. 1955 to the 1990s) were practically indestructible but rather ugly. 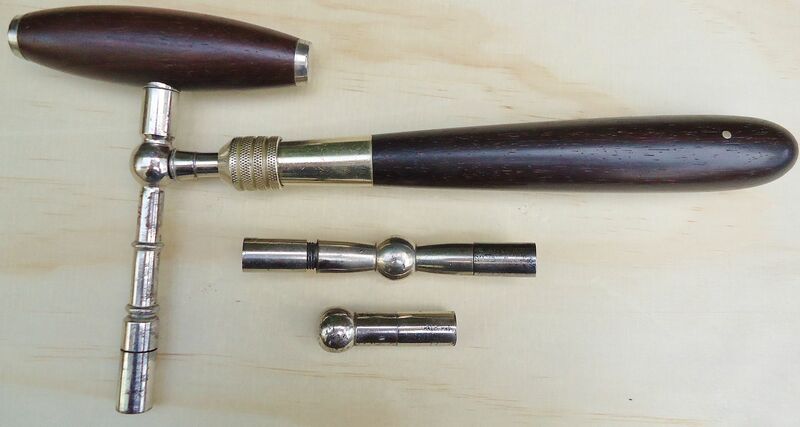 A major advantage of Hale hammers was the ability to fit various tuning tips with larger sizes for tuning pin sizes 3.0 to 6.0 used for restringing, and a smaller size for European and late 19th century pianos. Changing the tuning pin tip had to be done in the shop, though, because removing the tip from the head required a tip wrench clamped in a bench vise, and some force applied. For practical purposes in the field, separate heads would be carried, or even a second hammer with the alternative size tip socket. Post-WWI Hale hammers were different from all of the other types of antique hammers because they could be used to tackle just about any tuning or stringing scenario, while most other antique tuning hammers were good for performing a more specialized range of tasks. The structural integrity of the adjustable extension handle combined with the almost unlimited choices of heads and tips enabled the tuner to use it in almost any situation, from serious concert tuning and factory stringing, to quick and dirty remedial tuning on a spinet gone unserviced for 40 years. Francis Hale (1853–1933) was a music student at Boston University when he submitted his patent application on February 26, 1884, for this tuning hammer. His tuning hammer invention featured a collet tightened by an adjustable nut, which secured the variable extension lengths of the shaft. 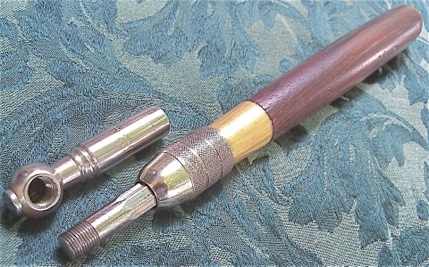 I believe that he was influenced/inspired by the adjustable tool handles which had become commonplace by the 1870s (see “Combination Handles” page). In the example shown below, there are several shallow holes drilled along the shaft to provide places for an auxiliary set screw which is located toward the back of the ferrule. This set screw is seen in the left hand side of figure 1, item “a”, of the patent illustration above. On the opposite end of the shaft is a fork-shaped clutch which, when the extension is fully retracted, provides a very secure means of unscrewing/removing tuning heads that can be very tight. This is shown as “D.” in the patent illustration. Item “e” is a brass pin drilled through the back part of the handle and through the internal hardware, to insure that it remains secure in the handle and will not work loose or rotate. 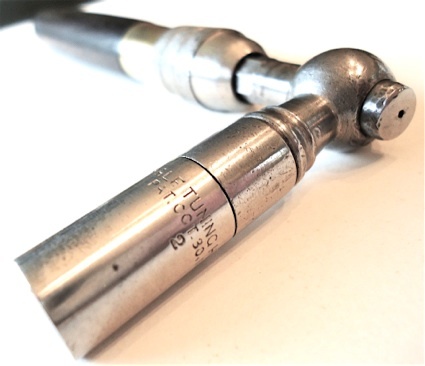 The head, “A,” is made of regular steel near the shaft,, and hardened steel near the socket for the separate tip, appropriate for securely screwing the tip into the hammer head socket. This separate tip, “f,” with male threads, is made of soft steel, and then hardened steel at the tuning pin socket, to withstand the hard usage and wear of turning tuning pins. The principal benefit of this arrangement is that the tuner had available a choice of socket sizes for the variety of pin sizes and shapes found in pianos in the late 19th century. 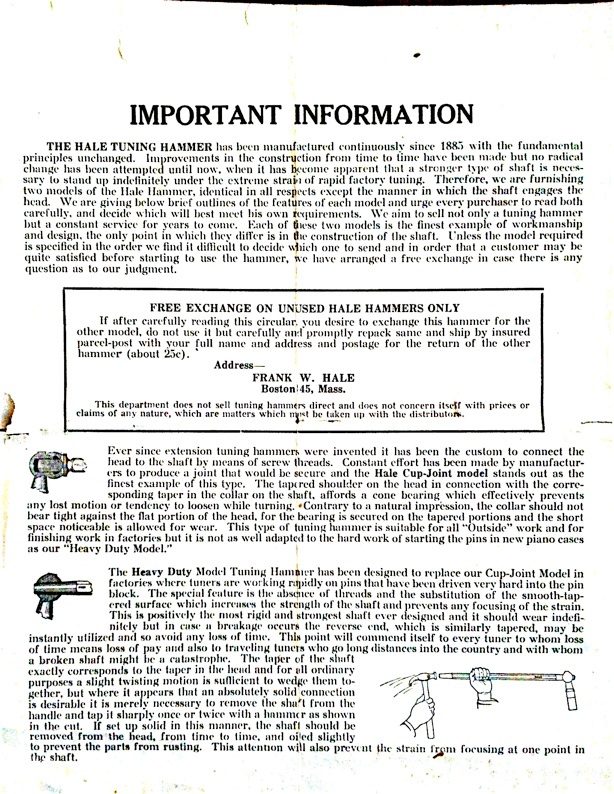 This tuning hammer model essentially marked the start of the (Hale) Tuners Supply Company. Hale hammer, early. This hammer head has a removable tip, with the male threads. The ferrule and adjustable nut are made of nickel plated brass. Another view, showing the set screw and the drilled holes for the screw along the length of the shaft. Opposite end of the shaft, showing half of the clutch. Early Hale hammer, c. 1890s, with head very close in appearance to that shown in the 1885 patent, the date of which is inscribed on the matching original double oblong head for it. This hammer has a ferrule, collet, and adjustment nut, all made from German silver, and Hale used German silver for this hardware until early in the production run of the “Cup-Joint” model, c. 1916 or so. German silver was used in many higher end tools in the second half of the 19th century, as it was showy, relatively easy to work, resisted corrosion, had low friction, and was somewhat more durable than brass. It had many uses, such as for piano center pins, keys for woodwind instruments, flatware, and jewelry that Indians made on the Great Plains. Manufacturers of this alloy, 60% copper, 20% nickel, and 20% zinc (with varying combinations), would compete to achieve the most silver-like appearance. The set/guide screw, was moved to the front of the ferrule, near the adjustment nut, and the shaft had a channel along its length, rather than divots for the set screw, allowing an unlimited number of length settings. And the shaft extension now had a flare, which provided a friction locking/mating surface for the head. 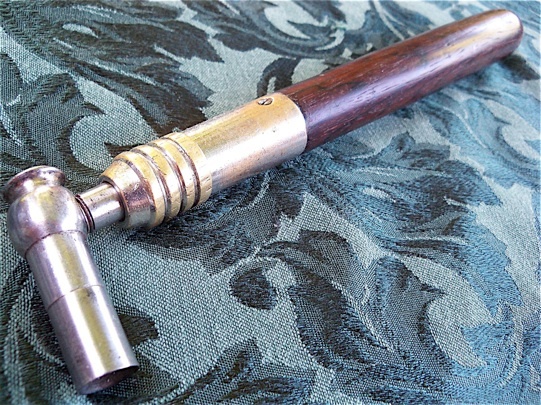 In other respects, the 1885 Hale tuning hammer remained pretty much the same as before. 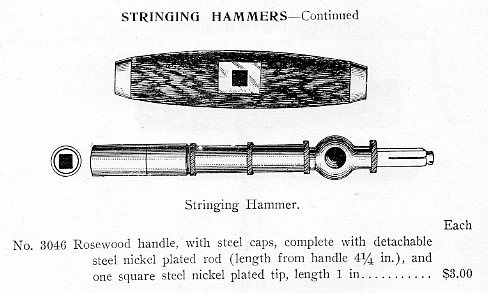 Hale hammer with 1885 patent, and similar hammer a few years later, with different knurling on adjustment nut, shorter head, and slightly longer tuning tip. While old Hale hammers enter the market occasionally, its more of a challenge to find examples in fine condition. Oliver Cromwell Faust (1859–1947), witness to Hale’s 1885 patent, and author of Piano Tuner’s Pocket Companion and The Pipe Organ and Player Piano–Construction, Repair, and Tuning, was also a student at Boston University at the same time as Francis. Francis Hale and Oliver Faust went on to work as colleagues at the New England Conservatory, with Faust as an instructor and teacher of a piano tuning program, and Hale as the business director and an instructor. Faust’s “Tuner’s Pocket Companion” remained in print for the entire duration of Hale, Tuners Supply’s tenure in business, and is still available today from Schaff Piano supply, who bought out the Hale name. The 1930 catalog mentioned the introduction of the detachable tips. The illustrations of the horse and carriage and the airplane underscore the dramatic changes that occurred in technology during the span of those years. Tuners Supply, or Hale’s mailing address, was Winter Hill, Boston 45, Mass. Their actual address was on Wheatland St., in Somerville, MA. Various street numbers found–for the same location–are nos. 88, 89, and 94. I remember going there in person, on numerous occasions, during my student years in the late 1970s, early 1980s. Boston University Yearbook for 1884. This was the entire third year class in the College of Music, which was established in 1872. The B. M. was a three year program at the time; the B. A. required the traditional four years. From the 1938 Hale catalog. The connection between Hale and Faust was lifelong. A drawing of the $50 tuner’s kit is shown on the intro page. This is the familiar patent that is marked on the tuning pin tips from the mid teens to the early 1950s. From 1906 to to the mid teens, the tips were marked in various other ways, some with the month and year, and some of the others with (Hale) Tuners Supply, Boston. Albert L. Hale (b. 1884) was a son of Frank W. Hale. He left the family business sometime before 1920 and moved to Tacoma, Washington where he raised a family. Engraved on this ferrule is “Hale Imp. Pat.,” which dates it to 1905 or 1906. 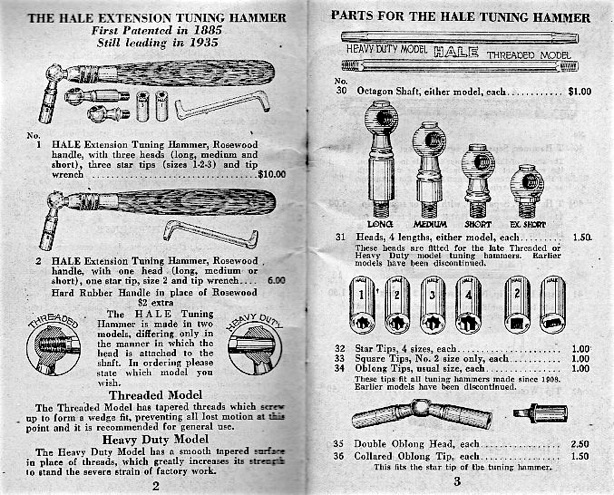 Hale tuning hammer set c 1905. 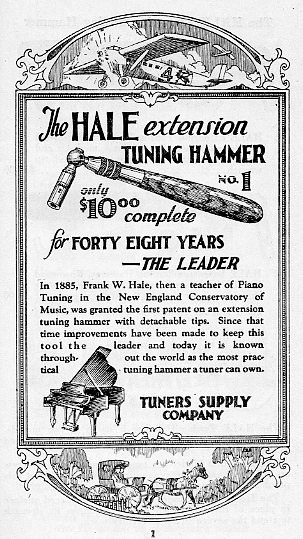 Hale’s “T”, or stringing, hammer also featured a socket for the lever, which provided another lever head which was much taller and permitted more clearance over obstructions, such as plate struts and protruding screws, found on many pianos. This was a variation on the patented idea of a single head with multiple sockets. Same version; ornate double oblong head and narrower handle. American Felt Co., 1911, this looks like older hardware, (c. 1904–1908) with the earlier head/tip. This model has a larger adjustment nut, a differently shaped handle, and most significantly, an octagonal shaft, which was a new way (for Hale) to prevent rotational slipping. Hale continued to use the octagonal shaft in their hammers until the early 1940s. This version has a tapered shaft and a more angular adjustment nut. The head accepts the post-1908 tuning tips. Looking similar to the drawing in Julius Erlandsen’s 1904 patent, is Hale’s tapered shaft, which was produced approximately eight years after Erlandsen’s. Hale placed the threads towards the back of the tapered section instead of at the front, as in Erlandsen’s. 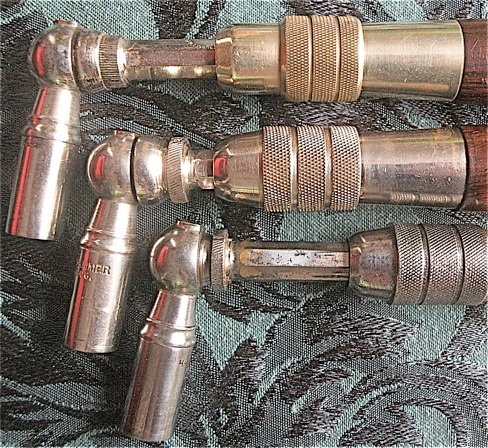 Three “Cup-Joint” tuning hammers. This concept was put into production without the slot on the back of the head, shown in the patent illustration below, which would produce a pinching effect on the threaded part of the shaft. The hammer at the top of this photo is engraved with “patent pending,” which dates it to 1914–1915. Relatively early in the production run of the entire series of the Cup Joint model, c. 1914–1925, German silver was discontinued. The adjustment nut was changed to steel and the ferrule was made of nickel-plated brass, as shown on the hammer in the middle of the photo. The plating invariably wore through rather quickly on these hammers, but the steel adjustment nuts held up better than German silver under heavy prolonged use. This model still had the straight, not tapered, thread, which Hale phased out c.1925–1928. 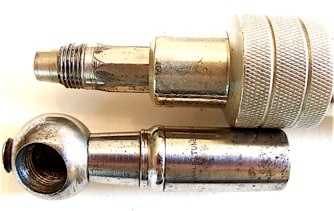 A cup on the shaft was eliminated in the version shown at the bottom of this photo, and a locking nut was used to secure the patented head instead. This tool belonged to the grandfather of my late business partner; he was a blind tuner. 1914–1915 version. Here is the patent for this design. Harold E. Hale (1889–1972) was another son of Francis Hale. In the 1930 census, Harold and brother Otis C. declared that they were managing a piano supply company (Tuners Supply). All three men owned their houses, as shown in the 1930 and 1940 census records, which is one indicator that the Tuners Supply business was profitable. After finding success in the piano tool and supply business by 1900, a restless Frank Hale decided to try his hand at other ventures. Frank was able to indulge in other work because he was successful enlisting his sons, Albert, Otis, and Harold with running the day to day operations of the Tuners Supply facility in Somerville, Massachusetts. After entering the grocery business around 1910, and trying his luck as an “oil man” in Oklahoma around 1920, Frank Hale returned to the occupation he really knew, which was pianos. Its fair to say that Hale’s direct experience as a piano tuner technician gave him insight into the market during the first decades of the 20th century. Hale’s work history led him to the development of tuning tips machined to achieve a fit on a range of tuning pin sets unmatched by his competition. It was not just the interchangeable tips: the actual taper of the star socket–slightly less than some from other makers–made for a better average fit over a range of pianos. Julius Erlandsen’s hammers and tools, dominant from the Civil War to about 1920, had superior build quality and materials on average, but Erlandsen lacked direct experience working on pianos, and the last level of insight into specific tuning and allied skills which would accompany that. Erlandsen’s focus, however, was on providing a wider range of tools and machinery for workers constructing pianos in factories, while Hale was interested primarily with the piano tuner in the field. This was underlined by the fact that Hale never offered any hand planes other than the Stanley 101, while Erlandsen made a full line of mitre and rabbet (rebate) planes designed specifically for piano making applications. Additionally, Hale introduced a general downsizing of tools and and popularization (but not invention) of the adjustable tool handle for the mobile technician. 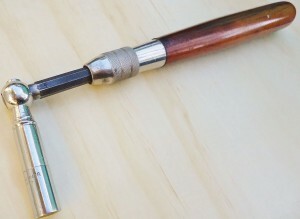 Hale’s unpatented voicing tool with swivel head (c.1916), allowing more hammer voicing to be done on uprights without partial removal of the action, was another important contribution. Modern tool makers in the United States, Germany, and China, still produce hammer voicing tools with the swivel head. Evolution of the Hale (Tuners Supply) voicing tool towards a swivel head. 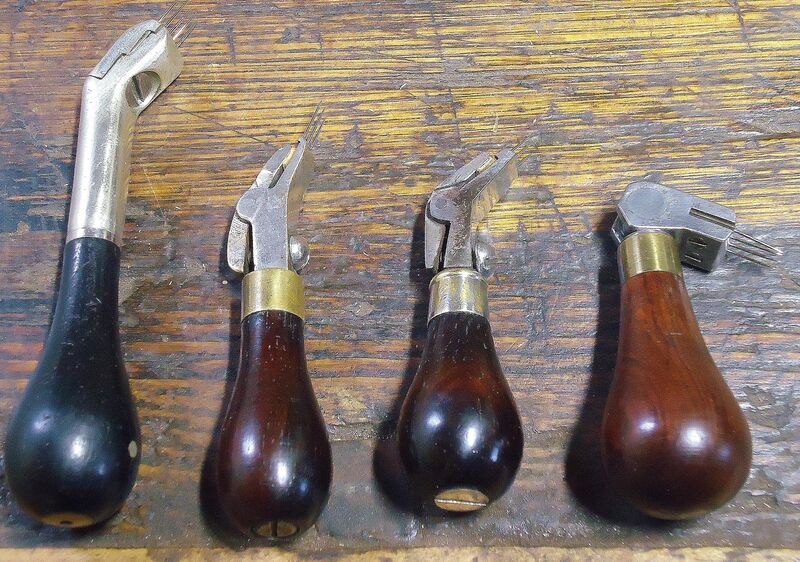 Left: 1880s to ~1905, German silver hardware, angled profile, and expensive to produce. 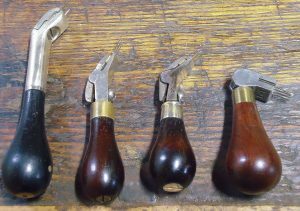 Middle two: fixed angled profile, use of a lever cap, not unlike a plane. Somewhat tedious to set up. Circa 1905-1910. Right: adjustable swivel head, introduced circa 1916. Early Hale voicing tools of these types before 1916 are rare. Other new items in the Hale catalogue included products such as the upright damper repair spring which hooks underneath the damper lever flange screw. New ideas were offered by Frank’s sons as late as the 1950s, such as the drum sanding collar for shaping hammers with a Dremel or Foredom type tool. This was an idea of controversial merit. While it is clear that William Braid White preferred the Hale over the Erlandsen, based on my research, an equal number of tuners preferred Erlandsen over Hale before ~1920. 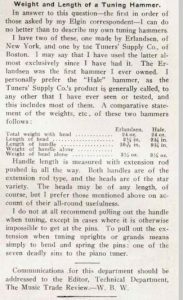 William Braid White went on to endorse Erlandsen, Hale, and Lang tuning hammers in 1920. A “Heavy Duty” model was introduced sometime before 1920, during the production of the “Cup-Joint” model. It is one of the few Hale tools that catered directly to the needs of the piano factory tuners, instead of the outside, or finish tuners. I believe that the ‘cup joint” model was discontinued, in part, because of cost considerations, and that the “heavy duty” model was discontinued because tuners had problems removing the heads from the shaft. Because of this heavy use, hand sweat would cause rust-freezing to take place, and the use of a hammer to release, an idea familiar to woodworkers, was not necessarily the case for tuners. Casemakers and bellymen would have been familiar with using the transferred shock of a hammer to separate, because that’s what is done in using hand planes for removal (in wedged planes) as well as adjustment if the iron. Its also true that the market of factory tuners considerably diminished during the span of the 1930s Great Depression. Thanks to Larry Lobel for this circular. Unthreaded, friction-fit model, intended for stringing, chipping, and rough tuning in factories. Its a user tool for me, and I work with it every day, but not for all of my tuning work. The fact that the shaft goes all the way through the head and past the fulcrum of rotation, makes this arrangement as close as one can get to tuning with a “T” hammer, but still having the leverage advantage. Another Hale piano factory model tuning hammer. Collector condition. Short head bored through, no threads. When modern piano specialists see these for the first time, often their first thought is they have been buggered by an impatient predecessor. But that is not the case. Cup joint model–version most produced. “Cup-Joint” model was replaced with a 1/8″ tapered pipe thread on the shaft, introduced c. 1925. This idea combined the “cup joint” and “heavy duty” concept into one model. But the unthreaded ‘heavy duty” model remained in production until about 1940. This particular threaded model with octagonal shaft was offered until at least 1940, at which time the shaft was change to round with a fixing slot.. Here is the 1935 catalog description of the threaded and unthreaded shaft. Incidentally, this is the last offering of a double oblong head that I’ve seen. An example shown at the bottom of this photo, made c. 1940–1945, was the last version to feature a rosewood handle, until Tuners Supply reintroduced rosewood as an option in 1985. This example has been shortened by a previous owner, possibly Peter Wolford of Marin County, California who bought it new. Hale returned to a round shaft, as used in their original version, and the shaft thread retained the 1/8″ tapered pipe thread (1/8″ = inside diameter of pipe), which allowed for limited ex-changeability between heads of different manufacturers. Early postwar models were made with laminated exotic hardwood veneers, impregnated in Bakelite resins—this was called “Artwood,” as shown by the two examples at the top of this photo. These handles are distinctive looking and are still in demand by tuners. 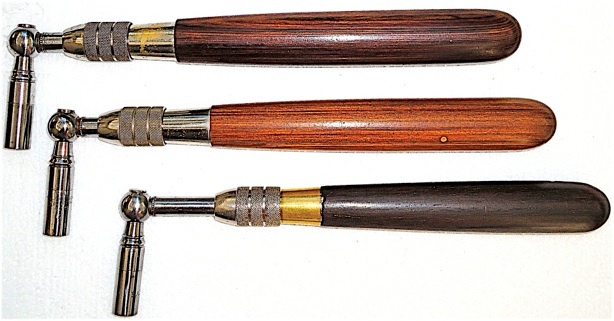 Later models were made with grey Polypenco nylon and a nickeled brass ferrule. Otherwise, this model remained essentially unchanged until the sale of Tuners Supply to American Piano Supply Co. in the 1990s. Two “Artwood” tuning hammers, 1940s to early ’50s. Hale hammer with round shaft and solid rosewood handle. This type was offered in small numbers during WWII, 1940-45. 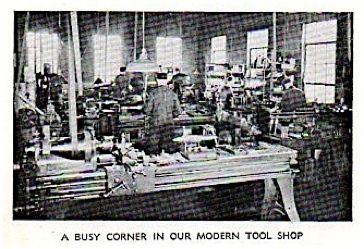 Hale tool making machine shop in the 1940s. Extensive use was made of belt driven machinery, which was actually technology used with the introduction of factory steam engines in the early 19th century. It would be safe to assume that the six men shown in this photo, were the entire staff of toolmakers working for the Hale family business. Hale’s staff of six was equivalent to Lang’s as an 1899 photo of C. H. Lang’s shop showed six men as well. Both Julius Erlandsen and Joseph Popping had six men working in their shops during 1897, as recorded by the “Annual Report of the Factory Inspectors of the State of New York.” Six seemed to be the magic number for these small piano tool makers.